attends premiere of Netflix's "The Killing" season 4 at ArcLight Cinemas on July 14, 2014 in Hollywood, California. 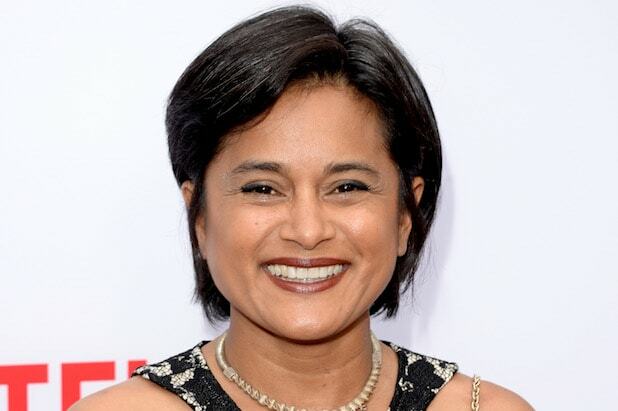 “The Killing” creator Veena Sud has signed on to write a remake of Sebastian Ko’s German film “We Monsters” for Broad Green Pictures, the company announced Tuesday. In “We Monsters,” a husband and wife struggle with their consciences after they try to conceal a terrible crime committed by their teenage daughter. The original film screened at the 2015 Toronto International Film Festival, where reviewers gave the movie high marks for the diabolical nature of the characters and its unexpected twists. “I’m absolutely thrilled to be partnered with Broad Green Pictures to tell this dark, intimate, and deeply poignant story about an American family,” Sud said. Alix Madigan and Shary Shirazi will oversee the project on behalf of Broad Green. Sud earned an Emmy nomination for her writing on the critically acclaimed series “The Killing,” which she created and executive produced. The show ran from 2011-2014 and garnered a multitude of accolades, including six Emmy nominations, a Golden Globe nomination, a WGA Award and a Humanitas Award. She’s represented by WME. The deal was brokered on behalf of Sud by attorney Bruce Gellman, while Christopher Tricarico and Nadisha Foster handled for Broad Green.